This Easy Homemade Lasagna is so simple to throw together, but tastes like you have been busy in the kitchen all day. And don't worry about cooking the lasagna noodles before baking - the oven does all the work for you. Do you ever feel intimidated by lasagna? The first time I attempted to make a homemade lasagna, I went all in – made a sauce from scratch in one saucepan, cooked my noodles in another saucepan, and browned my meat in a third saucepan. By the time I was done “prepping” the lasagna to go into the oven, I already had a sink full of dirty dishes! Do you need to cook your noodles first? For this lasagna, you do not have to cook your noodles before you bake it – just layer the uncooked noodles in your lasagna and they will soften while the lasagna bakes! This step alone will save you so much time. 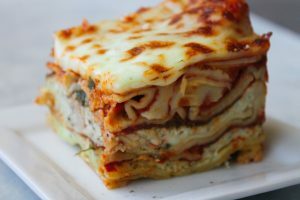 There are “oven-ready” lasagna noodles available at the grocery store, but they are not needed for this recipe – just any kind of regular lasagna noodles will do. How long to cook lasagnA? Because the noodles need time to soften, this lasagna does need to cook for 1 hour. If you know that you are going to have a busy day, you could easily prep this lasagna in the morning and keep it covered in your fridge until you are ready for it to bake. This lasagna also makes a great freezer meal or a meal to take to someone who could use a delicious homemade meal – I love to take it to friends when they have a baby. One question we frequently are asked is if it is really necessary to cover a lasagna with aluminum foil while it cooks and our answer is always YES – it’s very important! If you don’t cover it while it bakes, the top of the lasagna will dry out. We recommend that you cover the lasagna for the first 45 minutes of baking, but then remove the foil for the last 15 minutes so that the cheese on top can melt and slightly brown. Doing this simple step will give you a gooey, cheesy lasagna every time! For this recipe, the ingredients call for both ricotta cheese and cottage cheese. However, if you are out of one, feel free to substitute it with the other. In lasagna, ricotta cheese and cottage cheese are perfectly interchangeable. Cottage cheese is sometimes viewed as a healthier option because it’s lower in fat and doesn’t affect the taste at all. Make sure that you use a small curd variety, just so you don’t have lumps in your lasagna. If you are feeling super domestic, you can definitely make your sauce from scratch. In this recipe we take a can of store-bought spaghetti sauce and jazz it up by adding a few key ingredients: Italian sausage, onions, and mushrooms. If you wanted, you could also add a little bit of Italian seasoning for added flavor. Once your sauce is made, mix together the cheeses and egg. The egg is going to help bind the ricotta cheese with everything else and it also adds in some moisture, which is needed for the uncooked noodles. 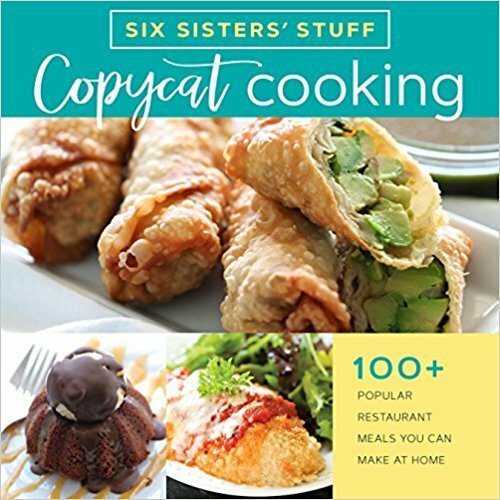 Now all that you have to do is layer everything in your pan, toss it in the oven, and let the delicious smell take over your kitchen! 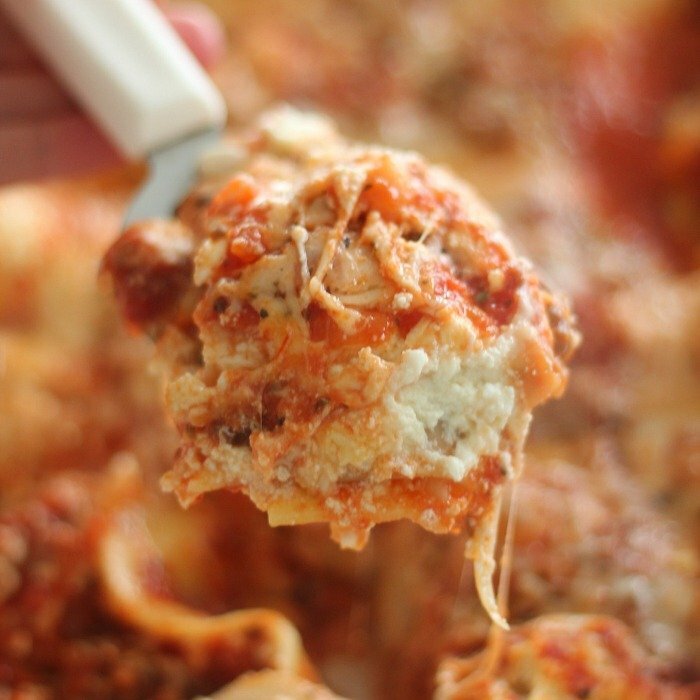 This Easy Homemade Lasagna is so easy to throw together but tastes like you've been slaving away in the kitchen all day! In a large skillet, cook and stir Italian sausage until brown. Add onions and mushrooms; saute until onions are clear. Stir in spaghetti sauce, and heat through. Spread a thin layer of the meat sauce in the bottom of a 9x13-inch pan. of meat sauce. Continue layering until all ingredients are used, reserving 1/2 cup mozzarella. Bake in preheated oven for 45 minutes. Uncover, and top with remaining half cup of mozzarella cheese. Remove from oven, and let stand 10 to 15 minutes before serving. In this video, we share how to make lasagna in your Instant Pot! Looks yummy! This is a dumb question, but will the lasagna noodles be cooked through? Do I have to use the "oven-ready" kind? I've seen other recipes that call for the noodles to be boiled before assembling the lasagna, so that's why I'm asking (I've never made lasagna before). Thank you! We just use regular lasagna noodles. We put them in uncooked and they cook through during the baking time. How do you prepare as a freezer meal? Prepare the lasagna as directed but do not bake. Cover well and place in the freezer. Thaw and cook when ready to have the meal.